I have done some drama at school and during English Camps, but I kinda neglected acting during my studies. 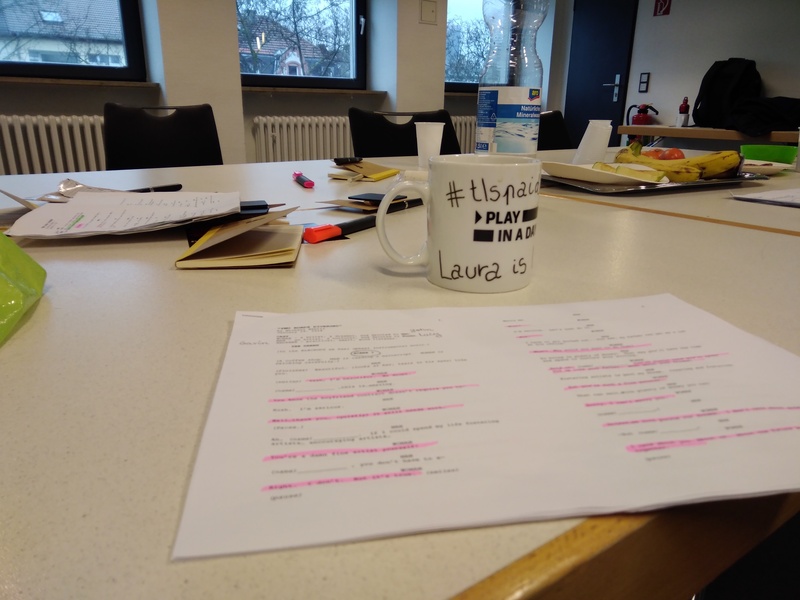 I am glad I took it up again, and after some screenacting and improv classes I found a super Play in a Day Festival that I could accomodate around my fulltime day job. I met the amazing team from TLS Frankfurt (Theater Language Studio ) last year and when they said they were doing this festival, I swore I will be part of it. I applied and got accepted as an ACTOR! We all met on the 19th of January and the theme and teams were selected, each with a writer, director and a couple of actors. Michael, the writer, an American who runs a children’s theater company, asked all of us to share what the theme meant to us. Esa, a Finnish sweetheart!, told us about his move to Germany and how it changed his life, finding a supporting partner and a great job. Livio, our Italian in cool suspenders, told us that he has taken a sabatical after the show, to go back to Sardinia and reflect on his future, maybe open a B&B. His job was not as fullfilling anymore. Lars, our beloved German director, shared how he had always wanted to be a scientist, much like Dexter in Dexter’s Laboratories ^^. He became a chemist and wanted a Phd scholarship in the USA, which he sadly did not receive. So he posed the question What would have been? And then came I, the girl who once stood at the crossroad MEDICINE or LITERATURE, and took the decision with her brain and not with her heart. I said I will sacrifice about a decade to earn good money so I can support my writing. But I also posed Lars’s question – what would my life had become if I had take a different road? After that Lars gave some last instructions and we all went home. Michael had to write all night long, while we slept. Well….we tried to sleep (so excited!). Michael had written us a marvelous play. Lars had already read it and he was literally crying with emotions. So we knew head-on that it was a drama. We did one table-reading and it became clear to us that our brilliant writer had incorporated all of our stories. A WHAT IF story, called 2 roads divergent. There were 3 characters: MAN, WOMAN, BROTHER. Michael asked us to give them names. He suggested finding someone who inspires us, so I chose Lucy! (L.V. Hay – check out amazing writing tips here). Esa was John, Lucy’s love interest, and Livio was Gavin, Lucy’s supporting brother. Lucy wants to become a writer and John is a painter and a supporter of the arts; both are quite poor. John asks Lucy to be his wife and he is willing to be the sole bread-earner so he could support her in becoming a famous writer. She does not want him to make that sacrifice. They both follow their dreams. John works in the hotel business, because he wants to get experience for when he will open a big B&B which will serve as an Artist’s Retreat. Lucy is a freelance -poorly paid- writer and is working on her first novel. She is frustrated that John is working so much -to support her-, but Gavin is always there to encourage both of them to carry on. Years later, Lucy is a New York Times Bestseller Author and John is running a very successful B&B for artists! They both postpone their dreams to earn money at first. They are successful in non-artistic jobs, but they both neglect their passion. Gavin is always there to support them and remind them of what is important. It is LOVE that keeps John and Lucy together. Years later, their business fails and they are bankrupt. It is that hardship that finally makes it clear to them that money is not important. Lucy finds work as a paid blogger and John rents their apartment as a small B&B. They are finally taking the step they should have takes years ago. It is never too late to change life directions! We rehearsed the whole day and we were all quite comfortable in our roles. We went on first and I must say I did not have stage fright, because I know, like any good actor, that the audience WANTS YOU TO SUCCEED! Plus I had full confidence in my amazing team mates! We did screw up some lines there and there, but we were all IMPROV actors so nobody really noticed 😀 Hihi. The other 5 plays were awesome as well! They tackled subjects like FEMINISM, FRIENDSHIP, FAMILY DRAMA and many more + there was a joke about a rabbit, a bear, a machine gun and a big pile of SHI%! Yes. That happened. It was so much fun being part of an amazing festival, even though it only lasted 24h! I have learned a lot and I have met the most interesting people. What I got out of this festival, besides the fun and new friendships, was a new outlook on my life. I will dedicate more of my time to writing and following my dreams. I will keep my day job because I have to eat… but I will publish my first book this year (with a passionate publisher and all!) and will definitely cut down my hours to work part-time. There is nothing more satisfying than doing something for yourself. I recommend this festival and TLS Frankfurt to anyone who loves theatrical arts and having fun! Will attend more of their workshops when I have to time to drive the 2h from Cologne, and I will definitely participate in the 2019 show!